Thomas Cole (founder of the Hudson River School) was commissioned to paint five landscapes of the northern Catskill Mountains and the Hudson River during the summer of 1827. 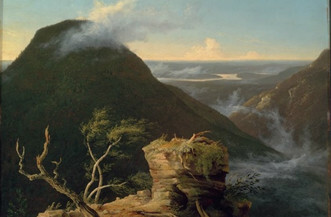 ‘View of the Round-Top in the Catskill Mountains’ subtitled ‘Sunny Morning on the Hudson’ is the only one of the five that faces the river from the west. His vantage point overlooks the southern hamlets of Purling, Round Top, and South Cairo from a point higher up Blackhead Mountain.